Dogs surfing isn't really new - there are videos from the 1930's showing Hawaiian dogs hit the waves - but Surf Dog Ricochet might be unique in the way she paws it forward. Thanks to Ricochet, countless people have overcome enormous obstacles. Ricochet is a Golden Retriever who started out being trained as a service dog. She also learned to surf, from the tender age of 8 weeks. The service dog thing didn't work out, but it was all for the best. Today, Ricochet surfs with kids with special needs, encourages people with disabilities, raises money for charities, and raises awareness for PTSD. She is also very active in anti-bullying campaigns, has taken part in a victim/witness support program helping abused children testify in court, and even learned to take cues from the synthesized voice of an iPad to work with persons who can't speak. Visit her website to read more about her work, the PTSD initiative, and tips on teaching a dog to surf. 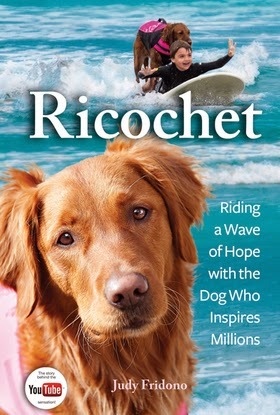 There is also a book about Ricochet, and on the cover, she surfs with her friend West. He is a boy with autism who found his voice thanks to Ricochet. West is sometimes bullied in school, and Ricochet raises support for him on her Facebook page.